Globally famous, experience amongst the most pristine coral reefs and best sustainable tourism in the world. Chumbe Island Coral Park is a small island off the coast of Zanzibar, off the coast of Tanzania in East Africa. The first privately established and managed Marine Protected Area in the world, and the only one fully-funded through ecotourism, Chumbe Island was set up by Sibylle Riedmiller. You can reserve with Booking.com but less money goes to the destination. On Chumbe Island, just seven thatched roof bandas (bungalows), are idyllically set in the surrounding forest, 30 seconds to the beach, offering natural beauty with privacy, yet a sense of freedom facilitated by the open design, providing natural air conditioning by the sea breeze. In fact, the only doors and windows anywhere on the island are in the 100-year-old lighthouse which offers spectacular views of the turquoise sea between Tanzania mainland and Zanzibar, especially for sunset. 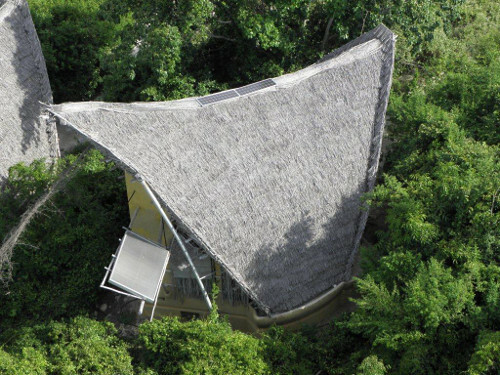 Bandas include a double or twin sleeping platform under a thatched area upstairs. Calm tranquility in nature abounds. The large living room, where tea and coffee is brought for you in the morning, features handmade furniture, African art and hammocks to add to the eco experience. To top it off, a section of the roof can be let down for a view of the ocean! Dining takes places in the former lighthouse keeper's home which has been restored and remodelled into a giant-clam-shaped visitors’ centre and restaurant bungalow. Dinner can also be taken outside on tables set up in the sand or by candlelight on the beach. Guests are offered typical Zanzibarian cuisine, a delicious blend of Asian, Arabic, African and European traditions, made from local produce to minimise waste, packaging, processing, pollution and food miles, transported in locally made, biodegradable baskets. This also helps raise awareness and pride in the local culture. Activities: As the whole of Chumbe Island is a nature reserve, you can explore at leisure or with the guidance of experienced local rangers. Over 20 years as a protection area means an exceptional amount of biodiversity in rare and endangered plant, animal and marine life. All guided activities are included and scheduled daily. Snorkel: Witness the breath taking beauty of more than 200 coral species on just one kilometre stretch of reef (90% of all coral species found in Africa) acting as a forest home, shelter and food for more than 450 fish species, plus turtles year-round, able to reside with enough food due to a no-take fishing zone and the park’s protected status. Be followed by Batfish, Spot Lobster, Blue-spotted Stingray, Giant Grouper, Oscar, a 1m+ potato grouper and large, colourful Parrotfish. 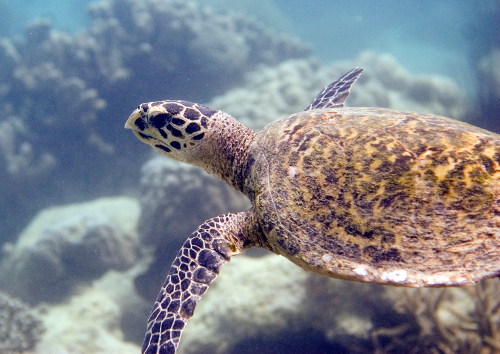 Although SCUBA is not in the Chumbe Reef Sanctuary (except for research and filming activities), it is possible to enjoy diving on nearby reefs. 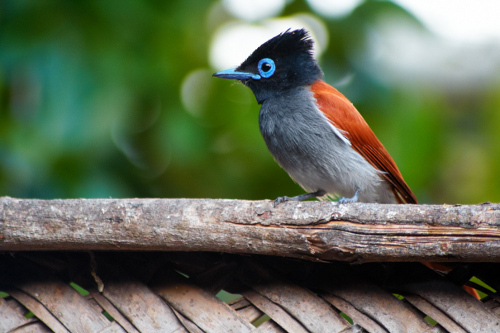 On the island: The virgin Chumbe forest reserve harbours extremely rare and endangered species, such as the giant Robber or Coconut crab, the largest land crabs on earth, endemic Aders Duikers and seabirds such as the Roseate Tern. With local guides, learn more about the geology of the island, plant adaptations to survive without groundwater, medicinal uses of local trees and shrubs, hidden fauna and the island’s inter-tidal shores. Several well-marked trails explore mangroves, baobabs and 15,000 year old fossils. You can also visit the lighthouse, which continues to function as an essential signal of shallow water to maritime users under Zanzibar Ports Corporation, and the mosque, built for the Indian lighthouse keeper by their community at the turn of the century and still used for daily prayers by Chumbe’s Muslim team members on the island. 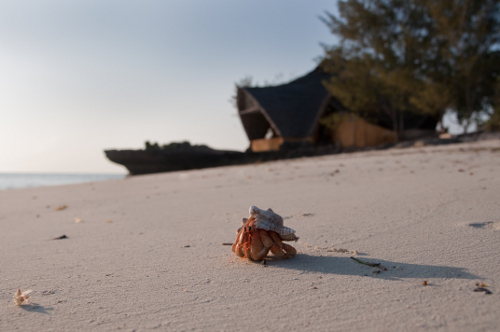 With just seven rooms, restricting guests to a maximum of 14, Chumbe Island probably has the highest employee/room ratio in tourism in Tanzania, and three times the international average for eco-lodges. Employment preference is for people from nearby villages: Of the 43 employees, 95% are Tanzanians, over two thirds from local communities. 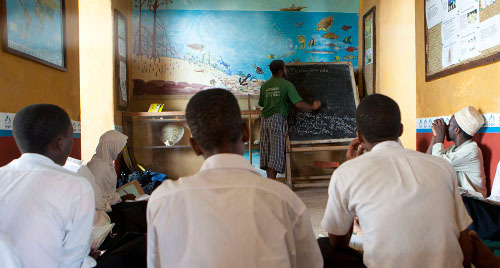 Though they have limited formal education, much on-the-job-training is given, with fishermen recruited and trained in data collection for research, park management and monitoring techniques for the reef and the forest to become as park rangers and stationed on the island, vital to community engagement with environment: A third of the staff are directly involved in conservation management and education and all other island staff, such as cooks, cleaners & waiters are also trained periodically in the basics of reef ecology, forest ecology, English language, ecotourism and eco-technology. Gender is also strongly considered, with women given preference and currently forming 40% of the Chumbe workforce. Local people are also offered income opportunities through the construction and maintenance of the ecolodge, food supplies, the out-sourcing of transport operations and handicrafts sold in the boutique. All organic soaps provided in the bandas are produced by a local women's co-operative. There is also the income spill-over effect of the no-take zone and Chumbe Island’s for Payment for Ecosystem Services model, even mentioned in the UN Secretary General’s Rio+20 report in 2012, “research findings confirmed that fish inside the protected no-take zone travel out and increase their yields in the vicinity” supporting local fishermen’s benefits. The programmes offer students, teachers and community members free island excursions, training workshops and peer education sessions to seek and inspire solutions to environmental concerns that build on indigenous knowledge, culture and traditions. By mid-2015 Chumbe had taught and raised conservation awareness with over 6500 school children, 1100 teachers and 700 community members plus developed understanding of its legal and institutional requirements with government officials. Chumbe Island founder Sibylle Riedmiller lived and worked in Tanzania and Zanzibar, where she witnessed no education, awareness or environmental protection for some of the most diverse coral reefs in the world, and little interest from the government for its value or tourism-generating opportunities. A passionate conservationist, diver and development professional, it was clear to Sibylle that a marine park to learn about natural resources and to snorkel could be funded by tourists, so ecotourism would pay for the conservation of corals and education of local schoolchildren and fishermen at the same time. Chumbe Island was thus set up from its conception to create an ecologically, socially and financially sustainable protected Marine Park and forest reserve. Chumbe Island's conservation, research, comprehensive education centre and state-of-the-art ecolodge are fully-funded by ecotourism and provide further benefits for local people through Chumbe Island Coral Park Ltd (CHICOP) non-profit organisation. The company objectives are non-commercial, while operations follow commercial principles. The bandas are designed for optimal outside rainwater catchment, captured by a cistern underneath the bungalow for showers in the downstairs bathroom. The composting toilets have zero sewage and no flush as water is too sparse. Solar panels, unobtrusive on the top of the roof, provide charge for battery storage for energy requirements, including hot water heating. Materials imported onto Chumbe Island are carefully screened to avoid any non-indigenous elements intruding into this spectacularly preserved environment. Only biodegradable detergents and soaps are used and laundry is washed off the island. The purchase of non-biodegradable products is avoided and non-biodegradable waste removed from the island and, where possible, recycled. Non-cooked fruit and vegetable waste is collected, composted and used for the composting toilets on the island. Drinking water is provided by advanced filters (made in Switzerland) located on the island – mineral water in plastic bottles is available but not encouraged due to challenging waste management. The island is not artificially lit at night to protect feeding and breeding patters of the nocturnal animals. A dedicated research board informs visitors about the ongoing scientific research it facilitates with academic institutions and the scientific community around the world, with the most recent scientific publications and reports made available on the website. Current projects include monitoring of Sea grass, Coral reef, Ader’s duiker and Sea surface temperature logging. Education, understanding, belonging and pride all support the sense of purpose created by founder Sibylle Riedmiller and diffused to each and every visitor to the island with honest heartfelt hospitality. Chumbe Island Coral Park is a short boat ride away from Stone Town, the heart of Zanzibar. Fly to Zanzibar then take a 10km/10 minute taxi ride to the Mbweni Ruins Hotel, south of Stone Town (pre-bookable through Chumbe in advance). Boat departure time to Chumbe Island is 10:00 a.m. daily from the beach of the Mbweni Ruins Hotel and takes 30-40 minutes. Advance booking for all reservations is required. Later boats to depart to the island can be arranged for US$50. Chumbe can also collect you from the Airport, Port or town hotels for US$ 12. Check out is at 08:00 for 09:00 return boat departure. The resort is open from June to March, inclusive. (April and May closed due to rainy season). Closed: The remainder of April and May. Children: Under 12 years - half price; Under 2 years - free of charge. All bandas have space for 1 extra mattress suitable for a child. Boat transport to and from the island on the morning transfer. Full-board meals, sodas, water and snacks. Boat, guide and equipment for snorkelling plus tuition in snorkelling, if required. Guided walk through the forest trails and intertidal area (if low tide). WIFI around the office (powered by solar). Excludes: Taxi transfers, late boat transfers, alcoholic drinks (available for purchase on the island).